For many people, a crossbow is something only seen in shows about medieval combat or dystopian survival. But a crossbow is the tool of choice for some hunters, and biologists use them to shoot arrows that collect tissue samples or deliver tracking devices to marine mammals like walruses, sea lions and whales. The image of a crossbow as a powerful, shoulder-fired weapon is accurate. And crossbows themselves are famously accurate at close range. The effective range is similar to a recurve bow or a compound bow, basically 20 to 60 yards, but the arrow is shorter and heavier. Most modern crossbows have scopes. 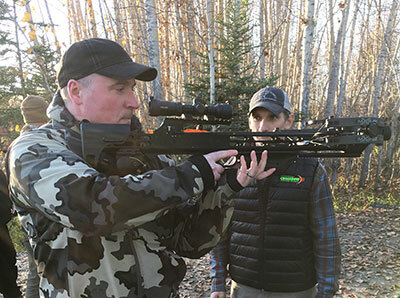 Beginning this year, Alaskans will have the opportunity to take a crossbow education course, and hunters using crossbows will be required to pass the course. 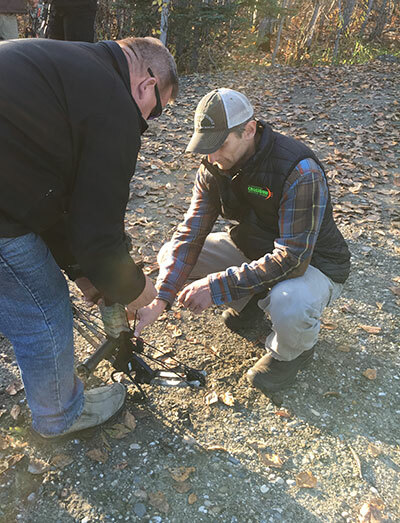 Fish and Game’s Hunter Information and Training (HIT) Program recently trained 50 instructors to teach the course, and more will join the ranks this year. Many of the instructors already teach bowhunter education and are experienced archers and bow hunters. Chris Alderman is a bowhunter and a crossbow instructor, and owns Screaming Eagle Archery in Wasilla. He said both his six-year-old son and his nine-year-old daughter shoot a crossbow. His daughter has harvested deer and black bear with hers. “She’s getting big, so we’re moving into a compound bow,” he added. Another perception most people have about the crossbow is that the bow string is drawn and locked (cocked), the arrow is loaded, and the shooter pulls a trigger. Cocking the crossbow takes effort, and Alderman does that for his kids. Mechanical aids are usually used, involving a lever, cords, or cranks, depending on the style (recurve or compound) and the draw weight. To hunt big game in Alaska with a compound bow, the draw weight must be at least 40 pounds, and at least 50 pounds for bigger animals such as moose and muskox. A crossbow is required to have a draw weight of at least 100 pounds. Alderman said the crossbows he sells have a draw weight of 185 pounds. The higher draw weight compensates for the much shorter limbs on the crossbow. Beginning July, 1, 2018, all hunters using a crossbow to hunt in Alaska must successfully complete the crossbow certification course. The requirement was proposed to the Alaska Board of Game with the support of the Alaskan Bowhunters Association, and adopted by the board. Ginamaria Smith, the HIT program coordinator, said the course was developed with an emphasis on the safety aspects specific to crossbows. Students take the first part of the course online, and after passing a written test, attend a field day with an instructor. A student is certified after passing a shooting proficiency test that involves shooting at four, three-dimensional animal targets, making five out of eight shots in the vitals at various distances less than 30 yards. Students must bring their own crossbows. Smith said the HIT program will begin offering field days in April. Trained instructors are in place in Anchorage, the Mat-Su area, Fairbanks, Juneau and Kenai, and more field days in more places will be added over time. “It was interesting when we were doing the instructor training,” Smith said. “At least a dozen of the instructors do own crossbows. But although the majority of the instructors are bowhunters, and some are instructors in other disciplines, most are not crossbow hunters. People came in with misconceptions or preconceptions. An archery instructor prepares to fire a crossbow at an instructor certification course in the fall of 2017. Jeff Jemison is an experienced bowhunter and hunter education instructor. He manages the Juneau Indoor Shooting Range for Fish and Game, and last fall, he became a certified crossbow instructor. He had shot a small, light crossbow before, but the class was his first opportunity to handle a hunting crossbow. He said someone recently walked into the Juneau range with a newly acquired crossbow and asked to shoot. Jemison gave him directions to the nearby outdoor archery range, and they started talking. As they inspected the crossbow, Jemison realized the man had bought the wrong arrows. The crossbow projectile is about 20 to 24 inches long, as opposed to an arrow 27 to 32 inches long for a compound or recurve bow. So crossbows are legal for regular hunts, but not “weapons restricted hunts.” However, in Alaska, it’s possible to apply for a method and means exemption, and use a crossbow in a weapons-restricted (archery-only) hunt. State permit biologist Brynn Parr said a hunter needs to fill out a one-page form providing information on what exemption they are asking for, and why they need it, and they need a doctor to write a physician’s statement and sign the form. She said about 40 or 50 exemptions are issued each year. Like all archery hunters, “exempted” hunters are required to pass the bowhunter certification course, and when the crossbow certification requirement goes into effect July 1, 2018, they will also need that certification. For a resident hunter, the exemption is good for five years, however this year, all the exemptions will essentially expire, and will be re-issued when the hunters document that they have taken the crossbow certification course. Nonresident exempt crossbow hunters also need to meet the two certification requirements, and their exemption is only issued for the duration of the calendar year. So why hunt with a crossbow? She prefers a crossbow for cold-weather hunting, because it’s harder to draw a bow and use “vertical” archery methods when she’s bundled up in bulky warm clothing. The regulations regarding hunting with a crossbow vary widely across the country. “In Ohio, it’s archery season whether it’s a crossbow, a recurve bow, or a compound bow. It’s seamless,” Terry said. Ohio’s fall and early winter hunting season also includes a shotgun season, a muzzleloader season, and a youth hunt season. As of 2017, crossbows are legal for use in archery seasons in 26 states. They are legal in firearm season, but not archery season, in 10 states. They are considered illegal hunting equipment in Oregon. Some states offer a crossbow hunting season within the regular archery season, or allow their use for physically challenged hunters, or senior hunters over a certain age. Terry has been tracking regulation changes nationally since 2003, noting that overall many states have allowed for broader use of crossbows. 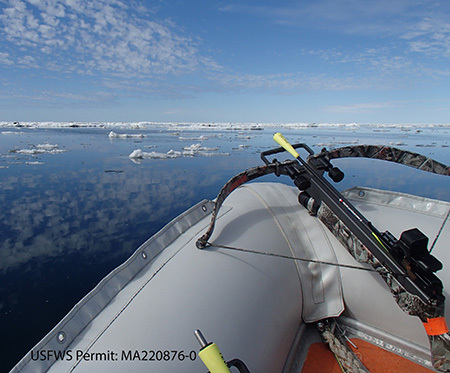 Wildlife biologist Justin Crawford has fired a crossbow thousands of times to collect tissue samples from walruses, and to tag walruses with satellite transmitters. He’s a researcher with the state of Alaska’s Arctic Marine Mammal Program. He said using a crossbow to collect a sample or deploy a transmitter has advantages over capturing an animal. Crossbows are also used to get genetic samples from beluga and bowhead whales, and Steller sea lions, he said. Crawford is based in Fairbanks and works in very remote, difficult-to-access locations in the Arctic. Once on the water, a team in a boat stealthily approaches a group of walruses hauled out on ice, careful not to alarm the animals. 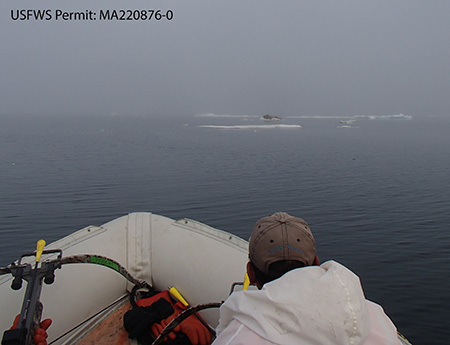 He described crouching down, peeking over the side, as the boat gets within 30 meters of the walrus. He aims for the back, avoiding the face and belly areas. He uses an over-the-counter recurve style hunting crossbow with a special arrow. It looks like a normal arrow, but the front quarter is a foam float device. The tip has a bolt and a biopsy punch is threaded on. Three little prongs on the inside of the tip hold a piece of skin about the size of a pencil eraser. “It hits the skin and pops off,” he said. “We just boat over and pick it up. The range is about 20-30 meters; we don’t want to get too close. An arrow that is equipped with a transmitter is heavier, and Crawford said it drops more over the shooting distance, so they get within 10 to 15 meters. A spade anchor holds the transmitter in place. This work was a collaboration among ADF&G, which headed the tagging project; the US Fish and Wildlife Service, which headed the collection of samples for a mark-recapture project; and the USGS. More than a thousand samples a year have been collected over the past several years. Mark-recapture is a method biologists frequently use to estimate the size of a population. This study will also provide insights into the age structure of the walrus population. Crawford said he practices shooting before the season, and he and his colleagues practice on the deck of the ship as they access the study areas. He appreciates the accuracy of the crossbow. To learn more or to sign up for ADF&G’s crossbow education certification course, or contact (907) 267-2196 for additional information.